Season 7 of HBO’s epic series Game of Thrones ended quite jaw dropping. Everybody just can’t wait for the next season to be released… in 2019?! While we know that the wall has come down and winter is here, Funko just solicited a new Pop! figure that every GOT fan MUST have this Chirstmas season. Here is Pop! Rides: Game of Thrones – Night King on Dragon. The terrifying Night King sits astride the resurrected dragon Viserion as they charge into Westeros. 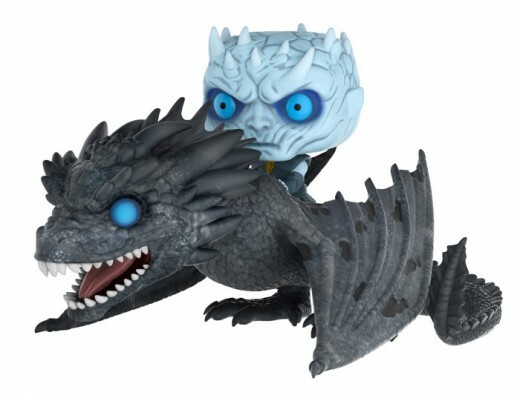 Funko brings the Night King and Viserion to Pop! with glowing blue eyes, the tattered wings of an undead dragon and an all-new frosty coloring. Pop! Rides: Game of Thrones – Night King on Dragon will be released in November. It’s A Ball With These Funko Disney Princesses! Funko Goes Strange With Their Stranger Things Collectibles!